My birthday present from Mark this year was a trip to the Theatre to see The Civil War, a musical. 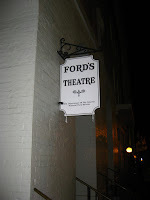 Ford's Theatre is a charming place, with a remarkable history. The supporters of the theatre have restored and protected it beautifully. 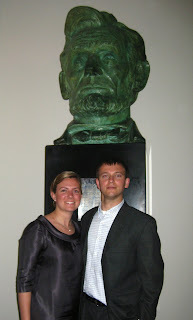 In honor of Lincoln's bicentenial, there is a full season of events being offered at Ford's Theatre this year. The Civil War is just one of the historic events the theatre is featuring honoring the legacy of our 16th president. It was a moving show, we had perfect seats - the best birthday evening ever! The musical was quite moving telling the stories of people groups who were impacted by the civil war. The performance was made up of many short segments that were woven together revealing every depth of emotion. I cried, laughed, must mostly felt filled with joy for our country. Celebrate the bicentenial by seeing, The Civil War!